If you are a Disney fan or have little ones at home this is a purchase you certainly want to make. Disney movies are always a treat and this older one certainly stands the test of time and remains an enjoyable story told through the eyes of some adorable dogs. Disney has always been known for offering viewers lovable characters, memorable songs and scenes that, good or bad, become etched in our minds forever. Often times they do this by using animals as their main characters to tell a story. When Lady and the Tramp debuted in 1955, it gave us all of that and more. The characters stole our hearts and had us hooked from the minute Darling opened her Christmas present to find an adorable little puppy inside. As part of Disney's "Signature Collection", the classic animated film is the sixth movie to be released on Blu-ray with some bonus material that wasn't previously found on the Diamond Collection Blu-ray. Lady (Barbara Luddy; Sleeping Beauty) was just a puppy when she came to live in the home of Darling (Peggy Lee; The Jazz Singer) and John Dear (Lee Millar; Space Patrol). Things were good there and she grew in a safe and loving environment. It was obvious she was well cared for and wanted. Then, things began to change and Lady wasn't played with as much and was even scolded on occasion. A Stray named Tramp (Larry Roberts; Damon Runyon Theater) explained that Darling is going to have a baby and that everything Lady knows is about to change. Of course, things seem ok for a short time but then Darling and John Dear go away for a few days leaving Aunt Sarah (Verna Felton; Cinderella) in charge. When Aunt Sarah's Siamese Cats set Lady up, she gets furious and puts Lady outside in the rain. Tramp comes along to show Lady the "free" life and they enjoy a nice meatball and spaghetti dinner. Everything seems to be going well until Lady gets caught by the dogcatcher and spends a day in the pound. Once she returns home, she is chained up outside but starts to bark when a rat goes into the baby's room. Tramp comes along to save the baby and after a short mix up everyone is safe. Tramp eventually becomes a part of the family and he and Lady have their own puppies. A beloved Disney Classic, Lady and the Tramp offers the audience a few memorable songs, including Bella Notte and the song sung by the Siamese cats (We are Siamese if you please). The story is typical Disney… everything is happy and grand, then something happens to change everything but finally, there is a happy ending, of course! The Blu-ray is presented in an upgraded 1080p video quality. The colors are bright and clean and the picture quality is sharp. The animation, while not living up to today's standards, was excellent for its time and it's hard to imagine in our computer-driven world that the whole 76 minutes of the film was drawn and colored by hand. The audio is DTS-HD Master audio 7.1, which showcases the soundtrack beautifully The upgrades are only slightly noticeable form earlier Blu-ray versions but crisp nonetheless. There are a number of extras in the combo pack but only some are new for this release. These include Walt & His Dogs, Stories From Walt's Office, How to Make a Meatball and Other Fun Facts About Lady and the Tramp, Song Selection, Sing-Along Mode, and Classic Bonus Preview. There are also other extras to enjoy a few on the disc while others are only the digital download only. Most are enjoyable and should be watched at least once. If you are a Disney fan, or have little ones at home, this is a purchase you certainly want to make. Disney movies are always a treat and this older one certainly stands the test of time and remains an enjoyable story told through the eyes of some adorable dogs. 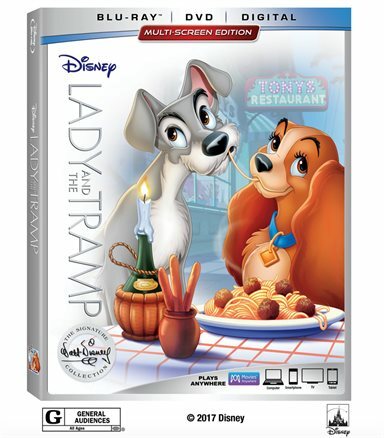 Download Lady And The Tramp Signature Collection from the iTunes Store in Digial HD. For more information about Lady and The Tramp visit the FlickDirect Movie Database.